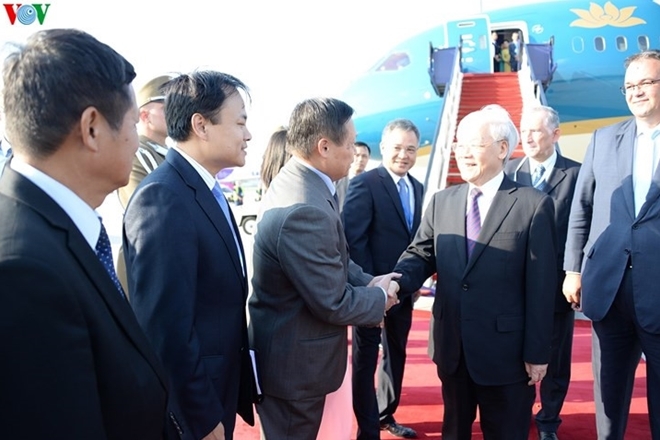 Party General Secretary Nguyen Phu Trong and his high-ranking Vietnamese delegation arrived at Ferenc Lizt International Airport in Budapest on the afternoon of September 8, starting their official visit to Hungary at the invitation of Prime Minister Viktor Orban. 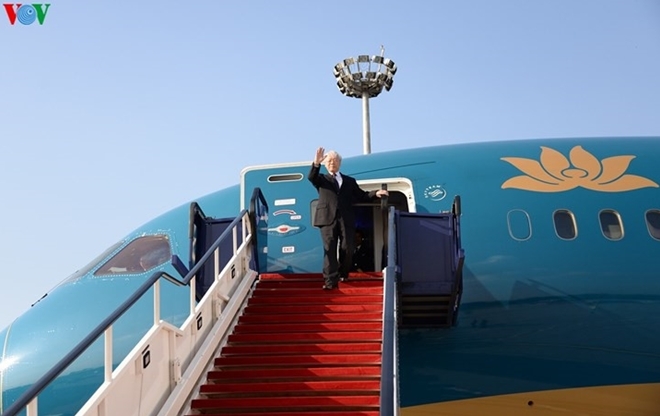 General Secretary of the Communist Party of Vietnam Central Committee Nguyen Phu Trong successfully concluded his official visit to Russia in the afternoon of September 8, and left Moscow for an official visit to Hungary at the invitation of Prime Minister Viktor Orban. His entourage includes Politburo member, Deputy Prime Minister and Foreign Minister Pham Binh Minh; Politburo member, Secretary of the Party Central Committee and head of its Economic Commission Nguyen Van Binh; Secretary of the Party Central Committee and head of its office Nguyen Van Nen; and member of the Party Central Committee and head of its External Relations Hoang Binh Quan. The Party leader is also accompanied by Minister of Planning and Investment Nguyen Chi Dung; Minister of Industry and Trade Tran Tuan Anh; Minister of Education and Training Tran Xuan Nha; Minister of Justice Le Thanh Long; and Chairman of the Hanoi People’s Committee Nguyen Duc Chung. 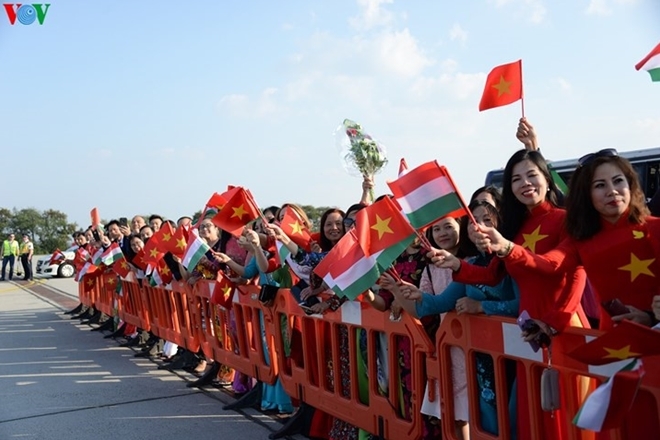 His Hungary visit holds historical significance as it is the first trip by Vietnamese Party leader to a country in Central Eastern Europe since institutional transformation in the region. It aims to create a new landmark and momentum for the bilateral relationship, while enhancing mutual trust and understanding between leaders and peoples of the two countries. 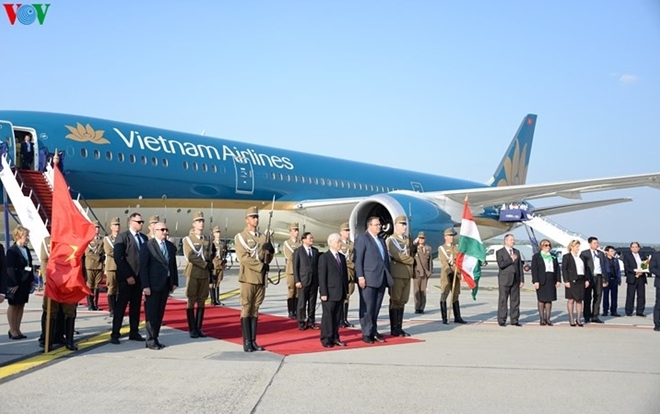 The visit is also expected to deepen the traditional friendship and multi-faceted cooperation between Vietnam and Hungary, and advance their cooperation framework to a comprehensive partnership in order to make new and more practical changes in bilateral collaboration across various fields and promote Vietnam’s influence in Central Eastern Europe. 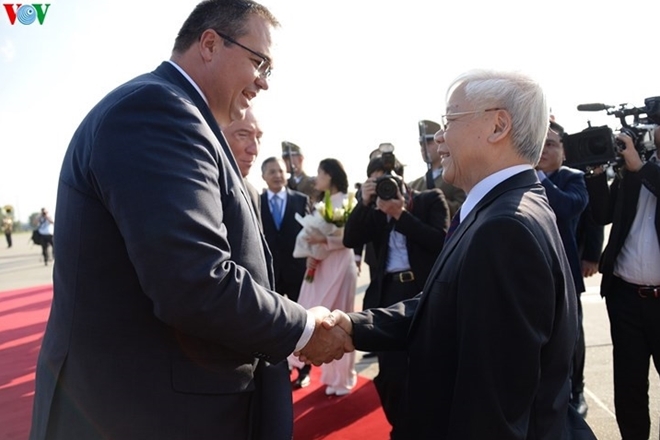 Through the Party leader’s trip, Vietnam wants to affirm its policy of considering Hungary an important and traditional partner in the region and enhance the bilateral relations in the areas of both sides’ potential and strength. Vietnam and Hungary established diplomatic ties on February 3, 1950. Over the past years, active progress has been made in the bilateral relations, with high political trust and regular exchange of delegations, especially at the high levels, through Party, Government, National Assembly and local channels.